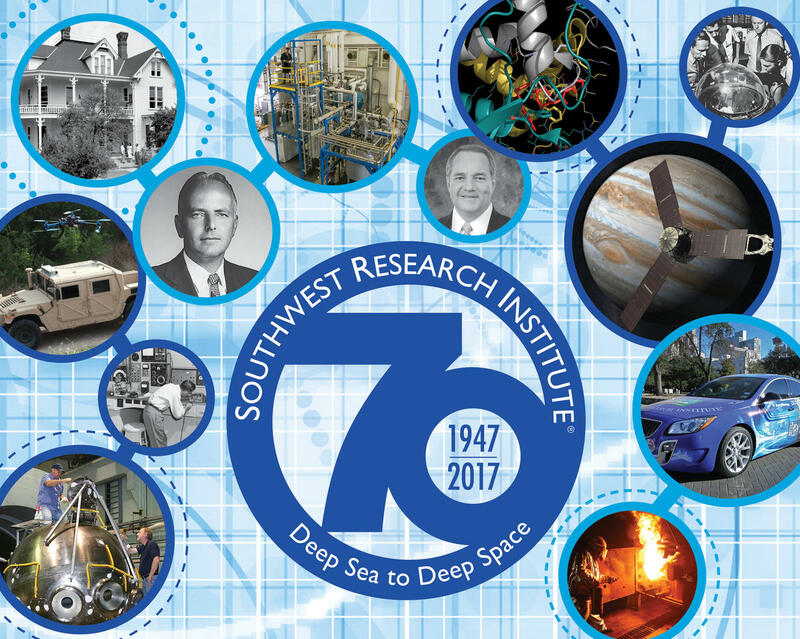 September 12, 2017 – Southwest Research Institute (SwRI) will celebrate 70 years of research that has taken the San Antonio-based facility from a ranch dedicated to scientific livestock production, to a leader in research from the deepest oceans to the outermost planets. Today, SwRI continues its original mission: benefiting government, industry and the public through innovative science and technology. The nonprofit institute, one of city’s largest employers with a staff of more than 2,600, will observe the landmark anniversary in special ceremonies on September 14 at its 1,200-acre campus. “Our vision for this organization is the same one that our founder, Tom Slick Jr., had back in 1947,” said Adam Hamilton, who is only the fourth SwRI president. “Tom Slick created an independent research institute that would focus on chemistry and the physical sciences and work toward the benefit of humankind. We’re still doing that today,” he said. Slick saw that the scientific advances achieved by the military during World War II could benefit a peacetime America, but the momentum needed to be sustained in a postwar economy. He sought to place San Antonio alongside other cities where independent research and development organizations were being created. When Slick organized the Institute two years after the war ended, he already had begun what today is known as Texas Biomedical Research Institute, and even before that he had established the massive Essar (phonetic for SR abbreviation of “Scientific Research”) Ranch, known for its champion purebred cattle and its innovations in livestock nutrition and artificial breeding. Another local organization, the Mind Science Foundation, also was a Slick creation. From its earliest years, SwRI performed research in wide-ranging areas, including direction-finding antennas for U.S. and allied warships, fire technology, microencapsulation, and oil and gas industry-related research. All these technologies remain active research topics today. From early work with experimental road paving materials and construction techniques, the Institute’s scientists and engineers now work with sophisticated industrial robots, self-driving vehicles, and next-generation automotive engines. SwRI engineers have improved the deep-diving capability of the Alvin research submersible, isolated the cause of the Columbia space shuttle disaster, and led NASA space missions. SwRI was the principal investigator institution for the highly successful IMAGE mission and now leads the New Horizons mission to Pluto, the Interstellar Boundary Explorer (IBEX), and the Juno mission to Jupiter, as well as the Magnetospheric Multiscale Mission (MMS) science investigation. “We like to say that we conduct research from deep sea to deep space, and everything in-between,” Hamilton said. SwRI’s Planetary Science Directorate is located in Boulder, Colorado.